Emergencies on the road Do not panic! Many situation can come out a lot better if you maintain a calm mind. Only drive in flooded areas in an emergency. When driving in flooded water be sure you can see the road. Never, never, drive into moving water! The power of moving water is unimaginable. You can be swept away by a swollen stream that seemed harmless the day before the rain. Not only is moving water powerful, but your vehicle floats! The combination can cause you to be downstream in an instant. Never cross a bridge with moving water over it. You are only held to the road by four small traction points on your tires. 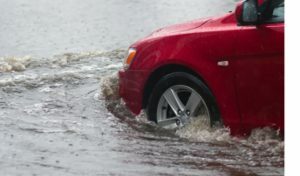 Your tire treads can be filled with water and your vehicle can be picked up and swept away. Bridges and roadways may have been washed away by the moving water and you would not know it. Do not chance it! Use must use an alternate route in this situation. Learn how to drive in inclement weather in our driver improvement clinic! Stay to the center of the road. Try to drive in the tires tracks of the vehicle in front of you. Do not accelerate quickly, nor brake in water. 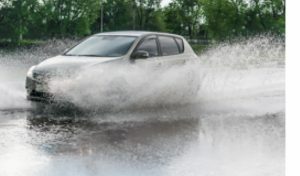 You should maintain a steady, even pressure to avoid any surges that would cause the water to rise suddenly and flood your brakes and vehicle. Therefore you should be sure to check your brakes when exiting the water. If your brakes are wet, you should dry them by pumping the brakes at the same time. The friction will dry your brakes out quickly. But do be sure and watch for any vehicle following you, as their brakes may fail also.